Adults cook. Kids vote. Most "Mmmms" wins. Choose one, or bounce back and forth. Either way, you can't go wrong. Both have spectacular Gulf views. Separate bedrooms and kitchen/living area get the thumbs-up from your entire crew. Your home away gives you the perfect perch for admiring the coast. Great views from the condo highrise. Everything from swimming, cook outs and an on-site fitness center. 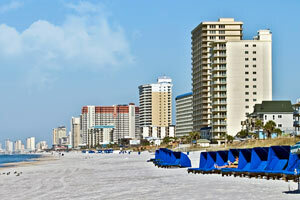 Sunrise Beach Resort by Wyndham Vacation Rentals looks out over the emerald waters of the Gulf. Drop off your luggage in your condo, get changed into swimsuits and slap on some sunscreen before heading for the pools. There are two outdoor tropical pools to choose from (one is heated seasonally) that are located on an elevated pool deck giving you excellent views in all directions. Hop on in for a refreshing dip or kick back and relax on a lounger and watch the kids play on the children’s splash pad. When it’s time for lunch, let your little helpers carry hot dogs, burgers and sides to the beachfront BBQ grills. Gather ‘round for a family cookout and swap seasoning secrets with fellow grillers. Being on vacation shouldn’t mean missing out on your daily workout. The well-equipped fitness center ensures that you won’t miss a beat on your cardio routine. One- to three-bedroom condos are individually decorated and sleep four to eight guests. Full kitchens allow you to save money by making your own meals. Assemble your famous lasagna and let the little ones supervise. While the lasagna is baking, gather everyone in the living room for a family movie on your flatscreen TV with cable & DVD player. Bring a selection of favorites from home and ask for a show of hands to decide what to watch first – Finding Nemo or The Incredibles? Show off your multi-tasking skills and throw a load of laundry in your in-suite washer/dryer while the movie is playing. Gulf World Marine Park is just a short walk from Sunrise Beach Resort by Wyndham Vacation Rentals. Interactive Programs include Royal Swim, Swim Adventure and Dolphin Encounter. Daily animal shows include sharks, turtles, sea lions and dolphins. Ready to shop ’til you drop? Pier Park Mall has you covered. Department stores include Dillard’s and JCPenney. Treat yourself to some bubble bath from Bath & Body Works, makeup from MAC or shades from Sunglass Hut. The kids will have a blast in Toy Kingdom. Starbucks is perfect for a mid-afternoon caffeine fix. When you get hungry, there’s Dave & Buster’s, Buffalo Wild Wings and New York Pizza & Grill. Coconut Creek Family Fun Park features a Gran Maze that is about the size of a football field. The route frequently changes to ensure a new experience every time. Two 18-hole mini golf courses provide hours of family fun for any skill level. Fans of Robert Ripley’s Believe It or Not cartoons will love the Ripley’s Believe It or Not Odditorium. It features Robert Ripley’s personal collection of strange and unusual artifacts including an authentic shrunken head and a 19th Century Vampire Killing Kit. - Front desk is open 9:00 AM-5:00 PM daily. Guests that arrive late can pick up keys from lock boxes located outside of the front desk. For more information please contact the property using information on the booking confirmation. The individual making the reservation must be 25 years of age or older and must occupy the rental property the entire term of the reservation. For each person checking in under the age of 25, there must be an adult over the age of 25 with them. Singles under 25 are prohibited unless accompanied by parent or legal guardian. Guests are advised to bring beach towels, as the provided towels may not be removed from the condominiums.